Ruth very kindly took some time out of her busy casting schedule to answer some questions for us to help you in assessing whether this is the right opportunity for you. How does the job fit around family life? I have a busy family life with a fab hubby and 2 gorgeous children aged 12 and 9, I love the work life balance my business brings to our lives. I have been running my keepsake business for over ten years now and I love it as much now as I did when I first started up. When my children were little I juggled appointments whilst they were home and worked round nap times and regularly into the evening once they were in bed. This enabled me to never need to rely on childcare or have the expense of nursery fees especially with 2 children. Once they were both at school it freed up more time for my business and this is when I decided to join Victoria at The Keepsake Association and increase my range. I trained in hand, footprint & artwork jewellery, raised impressions and 3D castings to add to the ever popular fingerprint jewellery. There is an abundance of school activities that I am grateful to be able to enjoy thanks to my flexibility. I love helping out on school trips, attending school masses, assemblies, nativities, as you can imagine the list goes on! But the most important thing to me is being there at the school gates morning and afternoon. It’s not the most glamorous but all my work is carried out in my dining room. Largely it works very well and means I have no costs for hiring a space ensuring I can keep my prices competitive. Working from home can be fantastic, I set up a lovely display for customers and they feel comfortable in the home from home environment. Discipline is key though. It’s so easy to allow household tasks to creep in but I have a very strict to do list for work and follow it to help keep me on track. The Keepsake Association group is fabulous for keeping in touch with others in a similar working environment so although I work alone I always have a community of support through them. Yes of course, advertising is very important to build awareness of a business, advertising targeted to parents and carers is key. A very large portion of my business is through word of mouth and repeat business for lovely, loyal customers. I enjoy welcoming back customers either with the same child or with a new addition, it’s great seeing people adding to their keepsakes. 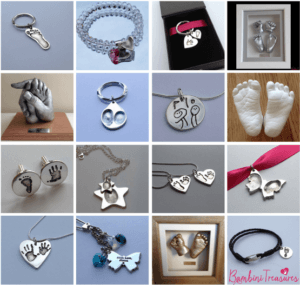 The Keepsake Association offer a listing on their website to show customers where their nearest keepsake artist is based, this is a great addition to the support given. It can be a little lonely at times but a quick chat within the group or a video call soon sorts that out! Extremely busy times like Mother’s Day and Christmas can be difficult to manage at times but I try to plan around these busy periods and be extra organised to help with the workload. Generally I work 9am to 3pm Monday to Friday. I try to stick to these hours to spend time with my children after school and take them to various clubs and enjoy play dates. during busy periods I may work at the weekend and evenings but I love the flexibility and freedom to choose my hours. Working from home also means I can be flexible with appointment times for customers for example people with school aged children can be seen later in the day or at the weeknd. It’s good to be able to change things to suit. For me my car is essential. Mostly customers come to me for their appointment but I do offer home visits too. I feel it’s important to offer this service for those who do not drive or have just had a baby where it can feel a bit much going out with a newborn. I also showcase my keepsakes at baby groups which I love doing and I occasionally attend fairs too, all of which having a car is essential for. The Keepsake Association offers brilliant support and on going training. Daily support is available from the other members, it’s such a helpful, professional group with varying levels of knowledge across all areas. I’m currently attending website training which is invaluable, I certainly couldn’t do it on my own! Why would you recommend this opportunity to other Mum’s? For me the big thing is the support group, any question, big or small is answered by a fab community of people. Some with years of knowledge in certain areas others who have just started and I enjoy giving back the knowledge I have gained over the years too. It’s a nice feeling being part of a community of keepsake artists. The training offered is brilliant, easy to follow videos and information and Victoria is always on hand to offer in person training or a video call to help trouble shoot.